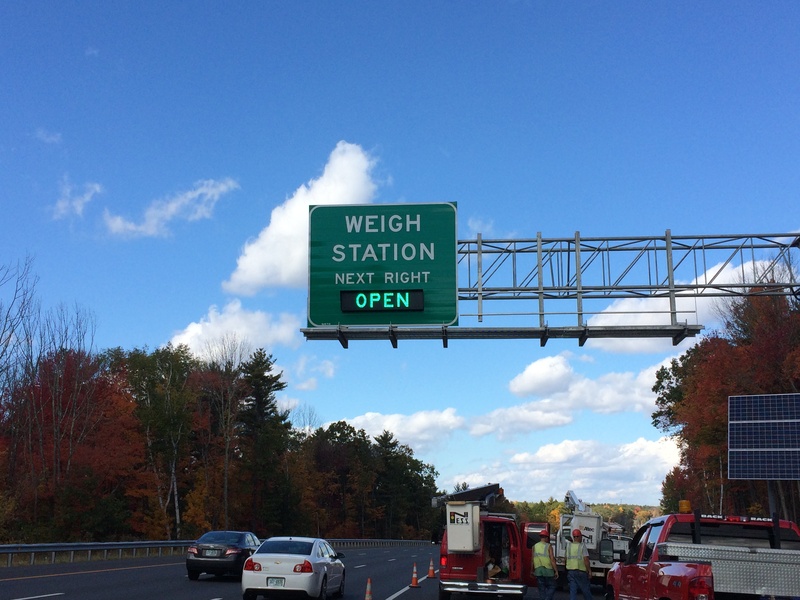 SES America(SESA) and its partners New England Traffic Solutions and New England Signal Systems recently completed testing and commissioning of Solar Powered Signs for several Weigh Stations in New Hampshire. These signs are installed on I-93 near Windham, NH and will be used to display the status of weigh stations (OPEN or CLOSED) on both the northbound and southbound directions of the highway. SESA provided the latest model of its energy efficient Blank Out Signs as part of the project, along with a complete solar power system that included solar PV panels, batteries, a solar charge controller and other accessories. The solar power system is designed to withstand both harsh winter conditions and the extreme heat of summer, and reinforces the concept that solar technology is a viable solution for Intelligent Transportation System equipment. The system required very little site work to install, eliminating the time and money necessary for installing traditional power cabling as well as the recurring costs associated with power provided from the grid. Blank Out Signs designed and produced by SES America, Inc. in Warwick, Rhode Island are part of SESA’s Mobility product line, an offering of products made to ease traffic flow, reduce congestion and improve road safety. Signs are made to resist harsh environment and extreme temperatures, and are tested as per NEMA TS2 in third party laboratories. Each sign can easily be connected with different monitoring systems and fault detection capabilities, as well as optional full NTCIP functionality. “We are very pleased with the successful completion of this project, and with our collaboration with all involved,” said SESA President Phil Perut. “Deployment of solar energy systems for ITS equipment is on the rise and this project illustrates the benefits of this technology”.